Bronx-born Margaret Bourke-White first gained recognition for her photographs of Cleveland's industrial factories and interiors in the late 1920s. Trained by the fine art photographer Clarence White in New York City, Bourke-White (no relation) utilized a Pictorialist-inspired vocabulary as an aesthetic foundation, soon supplanting its soft-focus Romantic style with a refined formalist abstraction. Successful from the start, her pictures drew the attention of publisher Henry Luce, who hired her as staff photographer at Fortune magazine, a lavishly produced, photographically illustrated publication that covered the international business world. Shortly after, Luce developed the first picture-based magazine, LIFE. Bourke-White's pictures were featured on the cover, and in the lead story, of its inaugural issue. In the macho world of photojournalism, Bourke-White was an unyielding competitive player. A talented portrait photographer, for her a self-portrait, she may be seen wrapped around a gargoyle extending from the Chrysler Building, then the tallest building in the world. In 1945, as a military photographer, she accompanied the top brass staff to the concentration camp Buchenwald. Her (s)heroic approach is the stuff of legend: according to a biographical entry, "She was torpedoed in the Mediterranean, strafed by the Luftwaffe, stranded on an Arctic island, bombarded in Moscow, and pulled out of the Chesapeake when her chopper crashed." Today, Bourke-White's stunning photographic prints are some of the most coveted pictures of the 20th century. 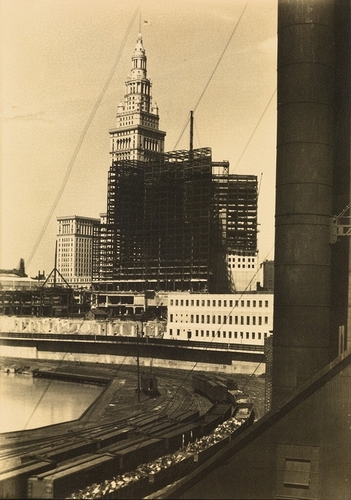 Swann is pleased to be offering a range of images, including an early view of Cleveland's Terminal Tower, as well as American studies from the 1930s.